Image treadmills are meant for those budget-conscious consumers and the Image 10.0 is no exception. Icon is the manufacturer of Image machines. The treadmill comes in at around $400 and it has features that are normally absent in entry-level treadmills below $500. When purchased new, Image treadmills cost below $600 and so is the case for the Image 10.0. Some of the newer models are priced in the mid-range. There are many different Image treadmills in the market and therefore it is easy to find a qualified person to take care of repairs. The brand recognition means that it will be easier to sell the equipment in case you ever decide to upgrade. All treadmills from Image including the 10.0 are easily foldable for under-the-bed-storage. Once you have finished your workouts, all you do is simply fold the treadmill so that it stops taking too much room. When folded, the approximate dimensions of the Image 10.0 are 22-Inches (L) x 36-Inches (W) x 65-Inches (H). This is just wonderful for those that are limited on space. The Image 10.0 treadmill is iFit compatible. If you decide to use this feature, you will get the coaching, motivation, and fitness personalization to make your workouts more efficient. The Image 10.0 treadmill has four pre-programmed workouts – 2 aerobics and 2 fat burning that provide the challenge for an effective workout. The computerized console helps you to track your progress visually with four feedback windows that display the time, speed, distance, and calories burned. The treadmill features a roomy 50-Inch x 18-Inch non-slip belt that is perfect for joggers. Use the heart rate monitor to workout in your target heart rate. Even though it comes at an affordable price, the Image 10.0 features a 2.0 HP continuous duty motor that has power inclines of 1.5% to 105 and speeds of up to 10mph. The treadmill has a user weight limit of 250lbs and this is surprising for a machine priced at below $500. Even though the motor is listed above as a good thing, it is also its weakest link. A 2.0 HP motor is not enough for avid runners since it is not enough. However, for the casual jogger, this will work fine. The major complaints that customers have about Image treadmills including the 10.0 is the track. The track length of 50-Inches long might be too short for those with long strides. The limited belt length with poor shock absorption leaves something to be desired. This is however not a big issue since if you are looking for treadmill at this price range all you will be doing is light jogging or walking at most. 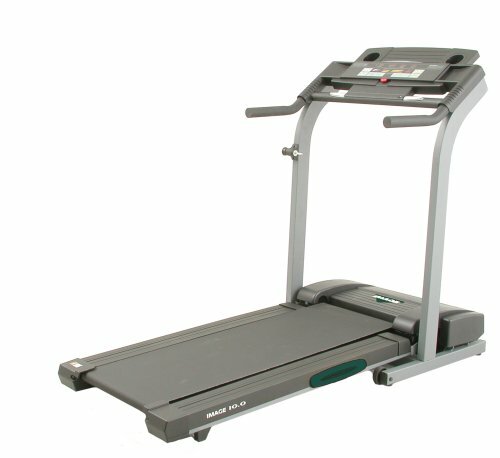 The Image 10.0 treadmill comes with a 90-day warranty in a market where the standard warranty is for around one year. The low quality materials used to make the treadmill probably leave something to be desired but you can expect that from a budget treadmill. The Image 10.0 comes at a very attractive price but the limited warranty and lower quality parts make it a shaky investment. However, if you are operating on a limited budget then the Image 10.0 is a definite buy. No other treadmill in the market comes close to this model in terms of specifications and features. Now that you know all about the good and the bad about the Image 10.0 treadmill, you will be in a better position to make your decision regarding your purchase. of time, but I really appreciate it!